Google Maps image of the distance between where a man with a sick plot was caught and The White House. A MAN has been caught metres away from the White House in Washington DC with a plot to kill "all white police", after allegedly travelling to America's capital to carry out the plot. Michael Arega, from Dallas, Texas, was arrested Tuesday morning AEST after a tip-off to the Secret Service Protective Intelligence Division from the Montgomery County Maryland Police Department. A statement from the Secret Service said Mr Arega had travelled "for the purpose of killing 'all white police' at the White House". The man's alleged Facebook page, seen by news.com.au, saw Mr Arega rant about "dismantling the power of darkness in the name of Jesus Christ". He had "checked-in" to the White House just after posting of his intent to kill. It lead agents on a chase around the city, until they found him an hour later at Lafayette Square, a public park located within the President's Park, directly north of the White House. 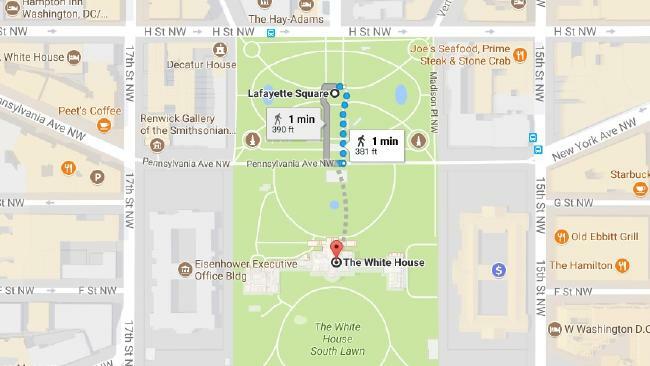 Google Maps says it is a one-minute walk to The White House. "Arega, of Dalls, was transported to the Metropolitan Police Department and arrest charges are currently pending. The investigation is continuing," a statement read.